Inside Out; or, an Interior View of the New-York State Prison, printed in New York in 1823, was a political autobiographical account by former lawyer and ex-convict William Coffey, which described the conditions and procedures of Newgate Prison. Despite commercial failure, the book retrospectively offers important historical insight into the corruption that pervaded at the penitentiary through the lens of an outspoken and articulate convict. The book is organized into eleven chapters: building, officers, convicts, internal punishments, crimes, sentences, labor, diet, hospital, pardons, and prison accounts. Each describes the corruption and inefficiency in one aspect of the prison procedure. In this essay, I detail and evaluate Coffey’s analysis of the organization and structure of Newgate Prison. Personal and firsthand accounts of prison conditions can demonstrate the observations and experiences of the convicts who underwent the “reformatory” procedures put in place by the creators and enactors of the prison system. William Coffey, a former lawyer and convict at Newgate Prison, published a short book that outlined the errors in the prison procedures based on his personal experience. He provides a candid and deeply opinionated analysis of ideologies and processes that structure the prison, which he argues are in opposition to the reformation of the prisoner. Born in New York City, Coffey served as a lawyer for several years before his incarceration. By age twenty-one, he was secretary of the Hamilton Society in New York City and by age twenty-two, he owned his own law office where he advised debtors declaring bankruptcy.1 Coffey was arrested for forgery and sentenced in May of 1819 to seven years of hard labor at Newgate Prison. Though he only served three, he developed strong feelings against both criminal and keeper at the Prison, both of whom he blamed for the moral decay of the incarcerated. In his 1823 work, published a year after his release, Coffey explains that Newgate Prison is unsuitable to the reformation of prisoners, enhancing the spread of vice through the communication among prison officials and prisoners. He suggests instead, shorter prison sentences dominated by solitary confinement, to prevent the corruption of convicts and induce a proper reformatory process, which would separate prisoners to ensure their reformation. Coffey describes his introductory experience upon entry into Newgate as highly surprising; he found levity and satisfaction in the disposition of convicts, rather than repentance or morose regret. They lacked the the self-discipline that would strip them of vice, with “cheerfulness and contentment played upon their cheeks; quietude of mind was visible in their actions” as they “evinced everything unmanly, obscene, and disgusting,”2. He describes a casualness with which his cellmates described their crimes and the shock it instilled within him when he listened. His first acquaintance at the prison was a convicted highwayman, who openly boasted of his crime during their first exchange. His bed fellow was a murderer, acquitted on his murder charge but falsely convicted for perjury after his honest admission of guilt before a court. While Coffey was quick to castigate his cellmates, he places further blame not with the prisoner but with his environment. In his first morning at the prison he was questioned extensively about the nature of his crime by curious inmates during breakfast. Four-fifths of the convicts ate meals in a designated halls and meals offered daily opportunities to intermingle. Coffey argues that this opportunity for interaction and the resulting exposure to an environment of criminal behaviors induced them in convicts, wearing away the stigma of immorality and the fear of its consequences.Coffey also suggests that virtuous convicts would necessarily adopt the behaviors of their associates in order to endure such an environment that fostered unchecked vice. Convicts would spend Sundays engaged in tawdry behavior such as gambling, wrestling, or singing obscenities, a poor “preparation of the mind, for the solemnity of divine service”3, which was designed to educate them in morality and aid in the reformatory process. The environment proved unsuitable to reformation and the interactions among inmates influenced the inexperienced toward a state of immorality. Newgate housed approximately 600 criminals together with no distinction based on sentence or crime, allowing for communication and a sort of cross-contamination. Bigamists spoke with highwaymen and petty thieves with murderers. Coffey describes the prison as not a “dome of penitence”, but a “college of crime” in which an executive pardon was “a collegiate diploma, evincive of the competency and proficiency of its possessor.”4 Among the convicts were those falsely indicted, sentenced by a quibbling, biased jury or due to the false evidence of a perjurer. The impoverished were also imprisoned for feeding themselves and their families and young boys were often convicted at young ages for mischievous or childish behavior and sentenced to a punishment that would advance their own criminality. Coffey notes the arbitrary manner in which sentences were decided. Cases of petty larceny could be constructed into burglary, so that a low-level criminal would consequentially be sentenced to Newgate rather than a local county prison, which would be more appropriate for the crime. By sending criminals of vastly different levels to a common centralized location, the corruption of the benevolent was essentially inevitable, even to those highly capable of reformation. Some convicts even arranged to become partners-in-crime upon liberation. Coffey describes how one convict was detected in a theft, tried, sentenced, and returned to prison on the same day as his liberation. There was a high rate of return for liberated convicts and some younger convicts were imprisoned twice before they even reached maturity. These boys became learned in criminality through social interactions, in which the “hoary veteran here imparted his feelings to the novice in crime, and instructed him where a deficiency in knowledge was apparent.”5 They might have learned an honest trade if not sullied by the influence of the elder convicts and made experts in a criminal trade by the time of their liberation. 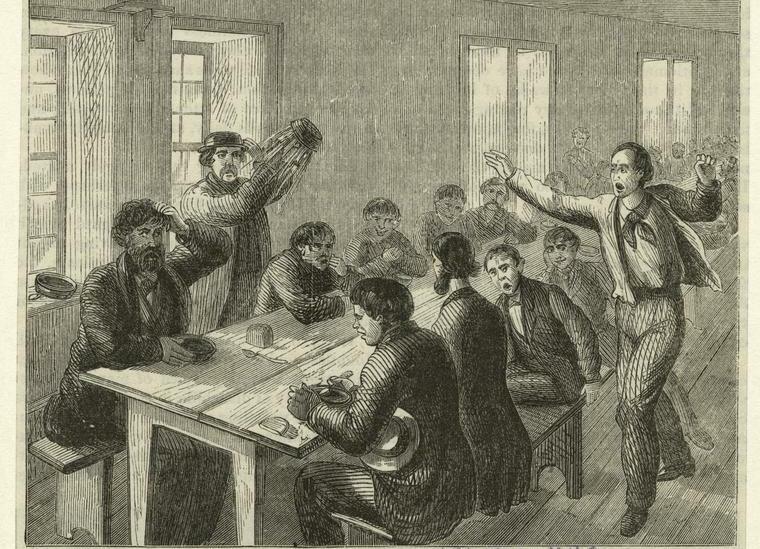 In addition to the influence spread through the interaction between convicts, there was an influence toward prisoners from the actions and behaviors of the keepers. Coffey describes the ideal role of a principal and assistant keepers as paternalistic figures, acting toward the convicts with gentle discipline, “slow to anger and lenient in his conduct and treatment of his fellow man.”6 According to Coffey, a principal keeper should not drink or swear during his work, nor should he abuse his power to aggravate petty conflicts or unnecessarily punish where rebuke would be sufficient. Likewise, assistant Keepers should obey the Principal Keepers, maintain self-discipline, and treat the convicts fairly. Coffey argues that interaction between keeper and inmate impacts the behavior of the impressionable convict, either toward mimicry of the vulgarity or distrust of authority. Coffey describes the abusive nature of the Keepers and their obscene pettiness toward the convicts. He recalls an anecdote from his first year in prison in which a poor, naive convict named Lynch committed suicide after a cruel joke at his expense. An assistant keeper claimed to have cohabited with his wife after she offered herself to incentivize good treatment toward her incarcerated husband. Lynch was driven mad by the claim, and after two days of emotional decline, he cut his own throat. Coffey also recalls a particularly cruel act by a principal keeper toward a convict with a severe psychological impairment. The keeper, for the sake of his amusement, struck the convict with the handle of a corn-broom to test the inmate’s mania based on his reaction to pain. According to Coffey, this sort of barbarism was common among the keepers who abused the power dynamic enabled in the prison. Coffey recognizes the difficulty the inspectors faced in finding suitable candidates for the keepers but he offers a solution to this abuse so that it would not corrupt the convicts. He suggests that prions “shut the convict up in a solitary cell, and let the immoral keeper utter his profanity and exhibit his vices to the incorruptible walls.”7 Coffey believes that sociality between keepers and convicts should be minimized to prevent negative influence and he believes that this is best achieved through the solitary confinement of convicts. While Coffey’s support for solitary confinement may seem opposed to the welfare of convicts and contrary to his former imprisonment, Coffey believed strongly in its use to effectively produce positive change for prisons and prisoners. Coffey was motivated by what he terms “public utility”8, to both discourage those contemplating crime and inform those with influence to strip the prison system of its tendencies toward abuse and reshape it to better fulfill its reformatory purpose. Coffey’s ideas received little attention and his book never rose to any notable popularity. Yet, while there was but a small audience interested in the weaknesses and reformation of the penitentiary, those informed on the subject generally shared his sentiments. The creator of Newgate Prison and first warden, prison reformer Thomas Eddy was famously displeased with the result of his work. prisoners were isolated visually and aurally, masked when first brought to their cell and allowed leave only into small yards behind their cells, which were individual and separate.12 Despite some early promise in the system, issues of morality and sustainability prevented its survival. As incarceration increased, limited space and resources resulted in a gradual easing of the segregation until its official removal in 1913. In this light, the potential of the system Coffey proposes is difficult to evaluate, in regards to morality, effectiveness, and survival. Yet the questions he raises in his proposal remain highly relevant. Coffey’s captivating account of the prison experience and its ineffectuality raises questions about the current prison system, which still resembles the ideology of Newgate. The incarceration of criminals and the structure of American prisons remains a controversial and heated topic of discussion, especially with the high rates of incarceration today. Past accounts of prison life offer insight into the history of the prison system maintained in America. The penal system has remained consistently complex and imperfect, but it can be explored through the observations, opinions, and experiences of past and present convicts to enhance our understanding of incarceration and its impacts on the morality of the imprisoned. 1″William Coffey, Early 19th-Century Prisoner-Author,” Communicating with Prisoners, , accessed November 28, 2016, http://www.acrosswalls.org/william-coffey-prisoner-author/. 2Coffey, William, Inside Out, Or, An Interior View of the New-York State Prison. (New York: Printed for the author, and sold by J. Costigan, 1823), 21. 9Samuel L. Knapp, The Life of Thomas Eddy: Comprising an Extensive Correspondence with Many of the Most Distinguished Philosophers and Philanthropists of This and Other Countries (New York: Conner & Cooke, 1834). 243. 11Charles Grove. Haines, Report on the Penitentiary System in the United States Prepared under a Resolution of the Society for the Prevention of Pauperism in the City of New York. (New York: Printed by M. Day, 1822). 102-103. 12Library of American History: Containing Biographical Sketches, of Washington, Adams, Paul Jones … Etc. … Revolutionary Anecdotes … Etc. Cincinnati: U.P. James, 1855. 375. Figure 5: Freedman, Lorri. “Eastern-State-Penitentiary-Philadelphia-PA-Cell.” Digital image. Lorri Freedman Photography. September 23, 2014. Accessed November 20, 2016. https://lorrifreedman.com/wp-content/plugins/widgetkit/cache/gallery/1695/Eastern-State-Penitentiary-Philadelphia-PA-Cell-849×1280-3787070c76.jpg.